Over the years I have originated many reverse mortgages in St. Petersburg, Tampabay and Florida. I believe each one is a personal decision made after careful consideration and education. My clients often tell me that they have had other people talk to them about the program but did not truly understand it until we sat down and talked. First and foremost, I listen. I listen to their needs and their objectives. Then I listen to them tell me what they “think” a reverse mortgage is. Some have a lot of misinformation, some need a little clarification and some totally understand it. The biggest obstacle to overcome is often a client’s reluctance to open up about their personal situation. 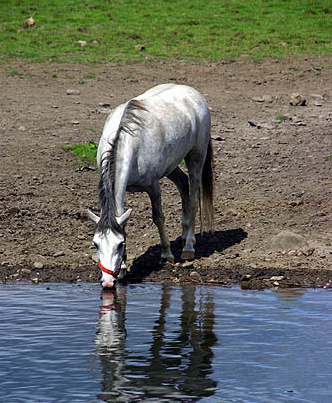 And as the saying goes, “you can lead a horse to water, but you can’t make them drink.” Having owned a horse in my childhood, I do know this to be true. One client in particular, reminds me of this old adage. Linda came to my St. Petersburg office with her boyfriend. I think an accurate description would be “she was led in by her boyfriend.” Although I visit the majority of my clients in the comfort of their home, I believe it is a client’s choice, and Linda chose to come to my office. I suspect so she could easily flee when the urge hit her. Linda, the boyfriend and I discussed exactly how a reverse mortgage works and in the end Linda walked out briskly, stating adamantly that she would “never get a reverse mortgage.” Thus she was not going to drink the water she was led to by her concerned friend. What Linda failed to mention was that she was already behind on her mortgage payments and her lender had served her a Lis Pendens, or intent to foreclose notice. Four months later, Linda and the boyfriend came back to my office. This time Linda told me that her lender had started foreclosing and time was of the essence. However, she still was objecting to the reverse mortgage. Linda now owed her lender additional penalty fees, lowering her net proceeds even more. I accurately estimated the reduced value and additional fees cost her $10,000 in less funds. During the course of her HECM (Home Equity Conversion Mortgage), Linda was dodging phone calls from her current lender. Repeatedly she asked me to field their calls and let them know she was in the process of a reverse mortgage. I did oblige, however her lender really wanted to speak with Linda. It was an uncomfortable middleman position. However, five days after Linda’s closing, she gave me a call. She briefly mentioned that she had received the check for the amount of cash she had requested at the closing. Then she asked me if I had seen a recent commercial featuring a Jack Russell. She said she imagined me and my Jack being just like the commercial and she would never watch that commercial without thinking of me. BINGO! We had finally connected. It was a long process. She may never divulge her reluctance but I finally felt that Linda was happy with her decision. Her boyfriend led her to the reverse mortgage (water), her pending foreclosure made her proceed (drink). But finally I felt that she was truly glad she had and whether she wanted to say it out loud or not, I truly think she finally got her peace of mind and found the water absolutely refreshing. ← Avoiding the obvious, sometimes it works, sometimes NOT!